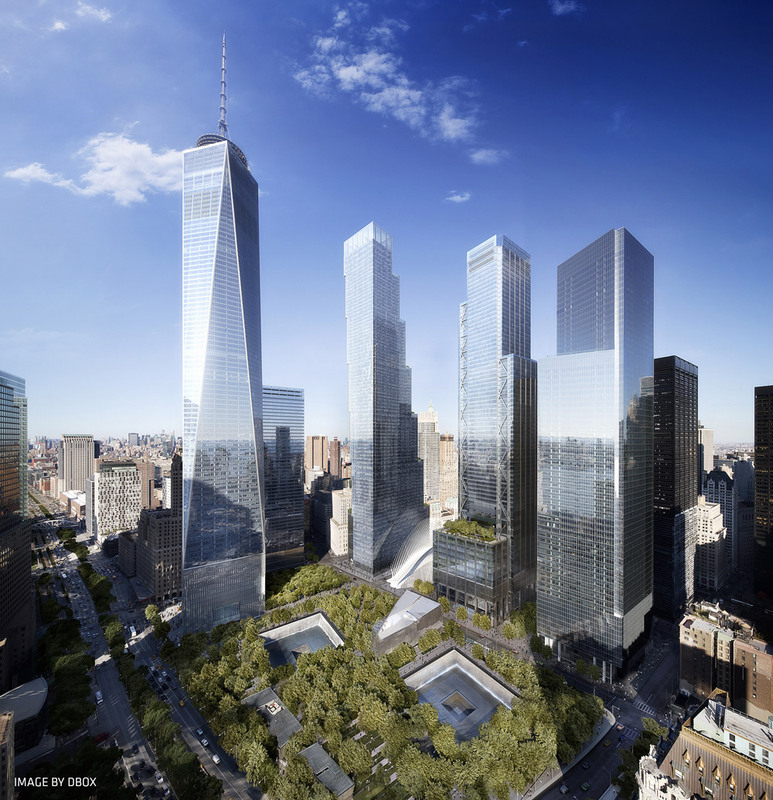 With the news that Bjarke Ingels Group has been tapped to redesign 2 World Trade Center, replacing Foster + Partners at the helm as architect for the tower, comes also the opportunity to change the dynamic at Ground Zero. It’s been 14 years since the Twin Towers fell and the rebuilding effort is all but complete, save for this last tower. But sadly, in spite of the billions of dollars and countless hours spent rebuilding Ground Zero, what we have to show for it is frankly uninspiring, save for the 9/11 Memorial, the transit hub, and the 9/11 Museum. At the end of the day, corporate will and the commandeering of the site by the Port Authority prevailed over common sense, trumping the needs of the victims’ families and the area’s residents and resulting in an odd confection that is part memorial and part office park and lacks any semblance of cohesiveness. While BIG can’t right the collective wrong of the more than decade-long rebuilding effort it can, through its design of 2 World Trade Center, make a considerable contribution to the site and possibly rewrite its history. Unveiled last week, BIG’s design calls for an 80-storey stepped tower comprised of seven stacked volumes off-set at various levels creating terraces. The beauty of the stacked design is its utmost flexibility. By varying the size of the volumes, the building can accommodate the needs of many different types of tenants, creating the potential for a diverse community form at the site. If all goes as planned, the building will be occupied by a mix of creative companies and other commercial tenants. 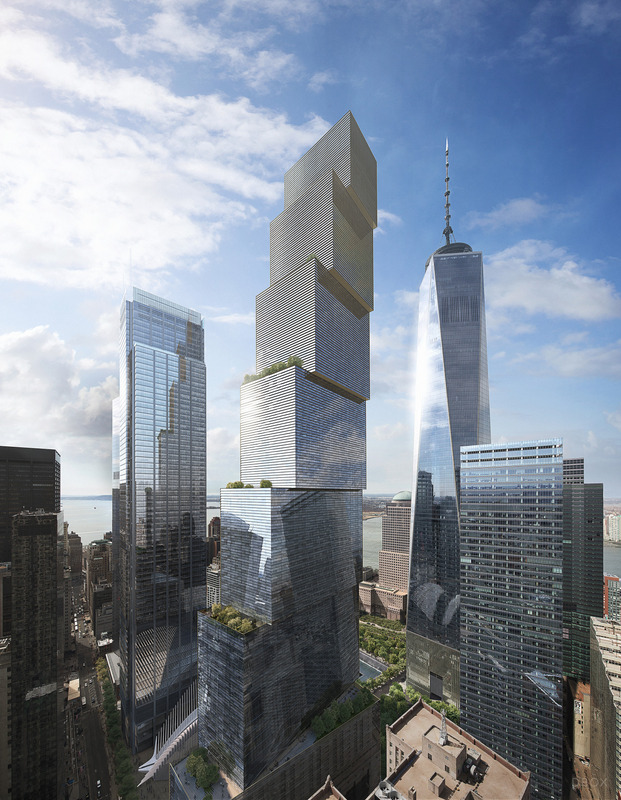 Rupert Murdoch’s 21st Century Fox and News Corp will occupy the lower half of the tower and developer Silverstein Properties plans on leasing the top half to office tenants. In addition to its flexibility, the stacked design creates a variety of spatial possibilities as well as some innovative features. One of those features is 38,000 square feet of outdoor terraces that will be lushly planted and provide unprecedented views of the surrounding cityscape. If desired, outdoor lighting could be added to the terraces and at the undersides of the setbacks, to create a dramatic silhouette of the building at night. As depicted in the BIG’s video of its design for the tower, Ingles already has an idea to use the underside of the setbacks to digitally stream news. Beyond its many positive attributes, the design’s most compelling feature is its aspirations to be a good neighbour. Its desire to fit in is perhaps best evidenced by its having four different facades, each of which responds to the different set of conditions. From the 9/11 Memorial the building appears as a tall and slender tower much like its three neighboring towers. Where it faces Tribeca, the tower is stepped in deference to the neighborhood’s low scale. And to preserve the sight lines to St Paul’s Chapel from the Memorial park, BIG has aligned the tower along the axis of Daniel Libeskind’s “Wedge of Light “plaza. 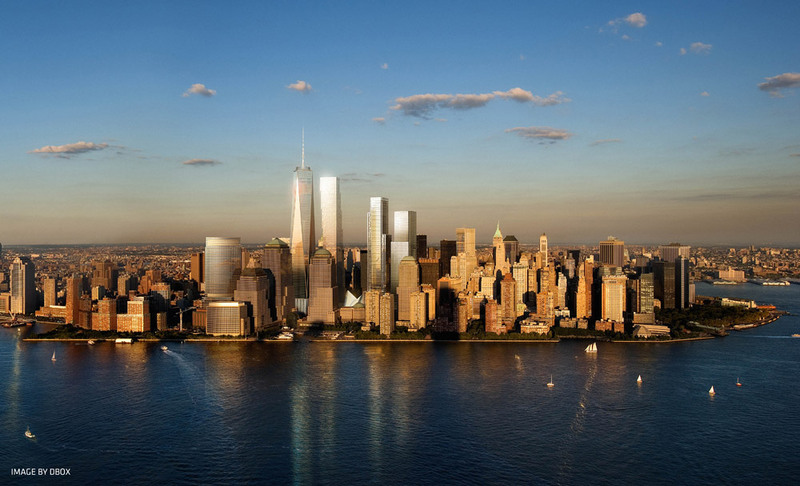 In designing 2 World Trade Center Bjarke Ingels Group said in a press release that it set out to meld high rise and low rise and modern and historical to create a community where “diversity becomes unity”. While it remains to be seen what if any kind of transformation the tower’s redesign will bring to Ground Zero, one thing is for certain. BIG’s design has a decidedly different attitude about rebuilding Ground Zero – one that better balances the needs of tenants and residents and exhibits far greater sensitivity to the grain and texture of the surrounding urban fabric. For this alone, there is reason to be hopeful.